CARDIFF, (Reuters) – Cristiano Ronaldo scored twice as Real Madrid beat Juventus 4-1 in a superb Champions League final full of attacking verve and brilliant goals on Saturday as the Spaniards won the title for the third time in four years and 12th in all. Ronaldo hit Real’s first and third goals to become only the second man to score in three European Cup finals and take his career goal tally to 600. Few of those will have matched Mario Mandzukic’s spectacular equaliser for Juventus, which was in vain for the Italian side who had the best of the first half before being swept aside in the second. A long-range deflected effort by Casemiro and a neat finish by the irrepressible Ronaldo effectively settled one of the most entertaining finals for years, a late tap-in by substitute Marco Asensio adding the final gloss. 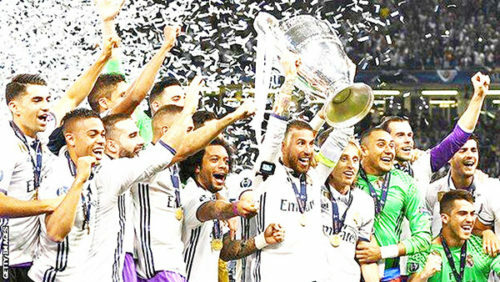 It was Real’s 12th title in their 15th final as they became the first team to successfully defend the crown in the Champions League era. AC Milan were the last team to retain Europe’s top prize when they won in 1989 and 1990. It was heartbreak again for Juventus, however, who were seeking a treble after winning the Italian league and cup. They came away as losers for the seventh time in nine finals having also lost to Barcelona in 2015. The Real Madrid players celebrate their successful title defence. Juve conceded more goals on Saturday than the three they had in the 12 games they played to reach the final as a much-vaunted Real attack v Juve defence scenario went emphatically Madrid’s way. It did not look that way initially as Juventus were full of attacking intent in the opening exchanges. Real gradually settled, however, and scored with their first chance after a trigonometric build-up. Ronaldo was at the heart of it, playing the ball into the path of Dani Carvajal who cut it straight back to allow the Portuguese forward to sweep the ball sweetly into the far corner. That made him the second man to score in three finals, after Alfredo Di Stefano, who scored in five in a row for Real in the 1950s, but he was far from done on the night. That effort was eclipsed seven minutes later by one of the all-time great final goals. Juve centre back Leonardo Bonucci drove a long diagonal ball towards the byline to set off a brilliantly skilful exchange. Alex Sandro reached it and cushioned the ball back across the box. Gonzalo Higuain knocked it to Mandzukic who took a touch on his chest and leaped, with his back to goal, to connect with a stunning bicycle kick that looped over Keylor Navas. The Juventus fans in the 72,000 crowd erupted, ramping up the atmosphere that was already crackling under the closed stadium roof. It was a different story after the break, however, and though Juve’s brilliantly drilled defence initially kept Real at arm’s length, they were undone by that two-goal salvo. Brazilian midfielder Casemiro made it 2-1 after 61 minutes when his 30-yard shot took a deflection that wrong-footed keeper Gianluigi Buffon and Ronaldo expertly swept in the third at the near post after a great run and cross by Luka Modric. The goals knocked the stuffing out of Juventus, who ended with 10 men after Juan Cuadrado was sent off in the 84th minute – 18 minutes after coming on as a substitute – following a second booking for the mildest of pushes on Sergio Ramos. Ramos’s theatrics were an unedifying moment in a generally uplifting final and, fittingly, it ended on a positive note when Marcelo charged to the byline and crossed for Asensio to tuck home the fourth. “It has been an incredible end to the season by us,” said man of the match Ronaldo. “The players deserve it and so do I because I scored twice and I’m the top scorer in the Champions League.